The Plantronics SHR2083-01 Ruggedized Headset is built tough. 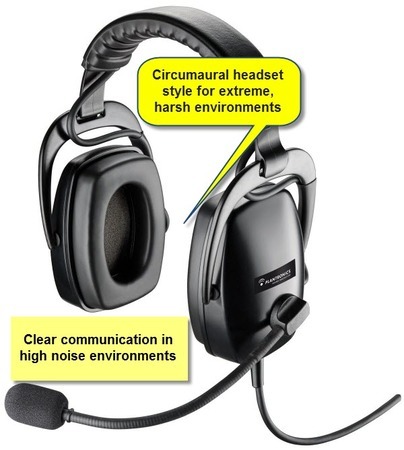 This Circumaural headset with its bidirectional noise-cancelling microphone, is used by Landing Support Officers on Aircraft Carriers. It also delivers clear communication in high-noise environments such as the New York Stock Exchange. People engaged in stressfull activities in noisy environments love these headsets - such as police & mining personnel. We have found that this headset can help people with hearing problems. The large earcaps completely enclose your ears - significantly reducing distracting surrounding noise. The quality noise cancelling microphone provides clearer hearing. Customers who have tried all other options can get hearing benefits from this headset. Australian mining companies have adopted this headset to work with their Push-to-Talk CA12CD radio systems. Although this headset is not cheap, if you need a brilliant, noise cancelling, headset for your noisy working environment, this headset is for you. Over the head noise canceling, Dual Ear Circumaural Headset style for extreme, harsh enviornments. The ear cups provide approximately 22dB noise reduction on your covered ear. Proven to help the hearing impaired converse on their telephone. Compatible with all Plantronics amplifier bases, including the CA12CD. Perfect for large call centres, factories, airports, mining sites or any other environment with harsh background noise. Requires appropriate Plantronics bottom cord to connect to compatible telephones or radio systems.